Urban farms are almost a cliché these days. Since the mid-2000s, media attention and increasing grassroots efforts have looked to urban farming as a kind of cure-all, a way to address a whole range of social, ecological, and economic problems facing cities and their residents. While I don’t want to dispute these ideas, I am interested in a more nuanced understanding of what it takes to make an urban farm “work.” How can these farms go beyond the hype? What challenges do urban farms face? It was these questions that drew me to write about my recent experiences with Frogtown Farm. 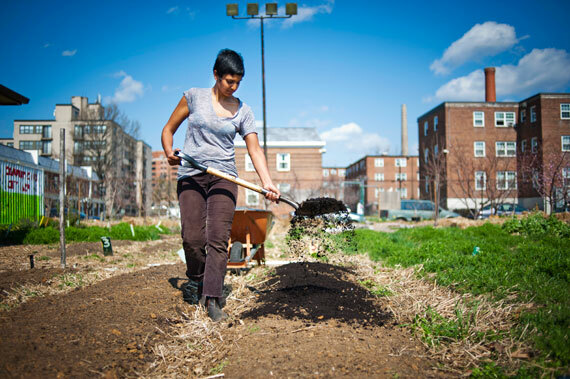 In 2009, four residents of the Frogtown neighborhood of Saint Paul, Minnesota, had a “crazy vision.” They wanted to turn a 12-acre site of a former convent into a park and farm, for the benefits of food security, inter-cultural education, and the green space needs of the community’s children. They took action, talked to their neighbors, and petitioned both the foundation that owned the unused land and the city of St. Paul to support their vision. The Frogtown neighborhood of St. Paul is, by statistical accounts, low-income, but it isn’t a “food desert.” There are plenty of ethnic grocery outlets and the Hmong immigrants in St. Paul are some of the most active urban and peri-urban farmers in the country. While there are many home gardens and a recent upsurge in small-scale urban farming projects, however, Frogtown Farm will be the largest single public farm site in St. Paul by far. It took four years, multiple campaigns led by an active board of directors, collaboration with local students and urban farmers, and a heavy load of fundraising, but by 2013, the city had signed on to support the idea. The foundation agreed to sell the land for $2.3 million, a price that was far below their original asking price of $12 million. While all 12 acres will become a public park, the six-acre farm within it will be run by the Frogtown Farm community organization. I was part of the team hired by that organization to help develop and facilitate a community process to design the farm. Frogtown farm is exciting for multiple reasons. The mere fact that the community succeeded in turning private land public is a victory in itself, a rarity in an age marked by government austerity, NGO defunding, and the displacement of many urban farms from valuable city lands. Thanks to the community’s organizing efforts and the financial support of the Trust for Public Land (TPL), the site will be owned by the city in perpetuity. The residents of this diverse neighborhood have long shown an impressive level of community activism that offers lessons for marginalized communities around the country (there are African-Americans, Latinos, and Whites, as well as Hmong, Vietnamese, Ethiopian, and Somali immigrants living in the area). Frogtown Farm also benefited from substantial financial support from St. Paul and TPL—making for a rare combination of ground-level effort and top-down support. But not all is roses. For one, the community was wary of outsider consultants. This isn’t surprising, as Frogtown has been subject to dubious forces of “urban renewal” since the mid 20th Century. After WWII, Frogtown developed into a thriving economy, where African-American migrants from the Deep South found home ownership and stability. In 1964, a highway was built that bisected the community, destroying many homes and businesses, and embittering the remaining residents. Fifty years later, the construction of a light rail line reopened these wounds when neighbors were “consulted,” but almost entirely ignored when it came to the decisions made. As such, it was crucial to have a community process where residents could share what they wanted out of the new park and farm, and have those desires listened to. After designing and facilitating this process, a few lessons became apparent. For one, in such a diverse neighborhood, extensive and sustained outreach is crucial. Next, it’s important to draw connections between various cultural groups to form a new hybridized food culture. In our case this meant reaching out through established community groups and institutions within the various cultural and ethnic communities in Frogtown, and communicating in various languages. Finally, there were differences of opinion about whether the farm should focus on producing food for sale or not. Some community members saw economic sustainability as a primary goal of the farm, and thus wanted to prioritize an efficient production model, while other saw education, community gathering, and increased social capital as the more important goals. The reality is that urban farms in the U.S. rarely if ever rely on their own produce sales to survive. Even Growing Power, the emblem of entrepreneurial urban farming, relies on grants, donations, and volunteers to function. The final design calls for a mix of revenue-producing and educational programs (including tours of the farm). Importantly, many programs will be pursued in partnership with existing neighborhood organizations, to reduce Frogtown Farm’s costs and increase community cohesion. Construction begins this year and the farm organization will begin to develop its programs and partnerships. Next year will be Frogtown Farm’s first true growing season. Frogtown Farm is in the enviable position of having a level of start-up capital that is uncommon for most social-justice-focused urban farms. But will it be able to sustain itself over the long term? Will it accomplish the goals the community has put forth? These are still open questions. Balancing the desires and needs of the area’s many communities will also be a challenge. Yet, if Frogtown succeeds, its example may offer valuable lessons for communities across the country organizing to unite—and heal themselves from political and economic inequities—through urban farming.